Mondays, 10 a.m. to 2 p.m.
Tuesdays, 3 p.m. to 6 p.m.
Wednesdays, 1 p.m. to 6 p.m.
Thursdays, 10 a.m. to 1 p.m. In addition to having an MLIS from The Catholic University of America, Christopher has a Ph.D. in musicology from the Graduate Center (with a dissertation on Charles Ives’ Concord Sonata), an M.A. in piano performance from Hunter College, and several years of experience working at RILM and in libraries and music libraries within CUNY and at The Catholic University of America. Please contact Christopher if you have any questions. Also, feel free stop by to introduce yourself and say hello! 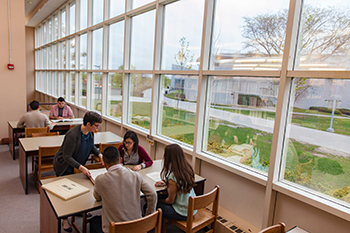 Part of the Queens College Libraries and housed in the Aaron Copland School of Music, the Queens College Music Library has evolved into a first-class research facility and is the largest music collection in the CUNY system. The Music Library is located on two levels in the School of Music building and contains over 35,000 scores, 30,000 books and 20,000 sound recordings. The reference collection, including complete works of composers and monuments of music, is one of the best in the New York City area. Special Collections, in the Benjamin Rosenthal Library, holds the Karol Rathaus Archives and the K. Robert Schwarz Papers.